Getting a compact tractor doesn’t mean having to make compromises. The YT235 and its enclosed cabin cousin, the YT235C, offer serious performance with the ability to use a wide range of attachments, making them an excellent choice for buyers looking to take care of up to 50 acres of land ranging from farms to managed properties. Both the YT235 and YT235C are powered by Yanmar’s 3TNV88C diesel engine. This three cylinder produces 34.2 hp at 3,000 RPM and meets Tier 4 emissions requirements without needing a particulate filter. The wheels are driven by a hydrostatic transmission that has three speed ranges, topping out at 11.7 mph (18.9 km/h) when driving forwards and 8.2 mph (13.2 km/h) in reverse when fitted with agricultural tires. 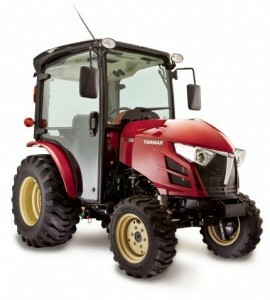 Yanmar also offers industrial and turf tires straight from the factory. This tractor has two throttle pedals: one to go forward and one to go backwards, eliminating the need to stop and shift when moving back and forth using a front loader. Cruise control and an automatic throttle come standard for easy operation and consistent performance. The YT235 has selectable four wheel drive and a rear differential lock that is engaged by a foot pedal, letting you use it where you need extra traction then quickly unlock it to reduce scrubbing. The engine drives a dual hydraulic pump, moving 7.1 gpm (26.8 l/min) to power the PTO and 4.1 gpm (15.5 l/min) to power the steering system. This is wholly separate from the transmission, so the PTO always receives full power. At the back, there’s a Category 1 three point hitch. It has a total lift capacity of 2,205 lb-ft. (1,000 kgf,) dropping to 1,764 lb-ft. (800 kgf) when lifting attachments to a height of 24 inches (61 cm.) For this attachment point, Yanmar makes several attachments including tillers, landscaping rakes, box blades, grading scrapers, disc harrows, core aerators, rotary cutters, finish mowers, a post hole digger, a stump grinder, a precision seeder, and a seeder made specifically for food crops. Of course, most third party Cat 1 attachments should also work with this tractor. The front loader mount uses an auto stand system, making it easy to attach and disconnect tools. It uses a skid steer style attachment system opening up a wide range of aftermarket tools, as well as Yanmar’s own tools including grapples, hay bale spears, pallet forks, a snow blower, multi-purpose broom, and plow blade. The mid PTO can reach a speed of 2,103 RPM. It’s designed primarily for Yanmar’s 60 inch gear-driven mowing decks. The YT235 has an open seating area protected by a foldable ROPS, while the YT235C is built for working in any weather with its enclosed cab, dual rear view mirrors, heater, and air conditioning system. Both models have the same capacities and can use all the same attachments. With either model, you get an automotive-style dash with engine speed, warning lights, and other information. There’s also a 12 volt outlet next to the operator position for powering accessories. Shanks Lawn Equipment is a certified Yanmar dealer providing service and support for their tractors, engines, and accessories. We’re located at 4900 Molly Pitcher Highway in Chambersburg, PA. That’s just off Route 11, or you can get here from I81 by taking Exit 10 to Marion. Not a local? We ship parts and accessories to any address in the U.S. and Canada. Visit us online at www.shankslawn.com. This entry was posted in Uncategorized and tagged diesel engine, Yanmar, YT235, YT235C. Bookmark the permalink.